A-Frame Hoop Bundle in Dance Poles is made for Women and Men and comes in Chrome and is made of Chrome material. It is marked as DancePoles and weighs about 130.00 lbs. The new X-POLE A-Frames are lightweight and you can take them with you on the go! The A-Frame is adjustable to fit your needs: it can be used from 8 ft up to 11 ft, so you set it to the height you desire! The A-Frame can be moved around and can be used for multiple discipline set-ups including: hoop, low silks and hammocks. You’ll also get some accessories!! When the A-Frame is at it’s lowest height of 8 ft, you will need floor space of 4.4 sq meters. When the A-Frame is fully extended to 11 ft, you will need floor space of 8.9 sq meters. 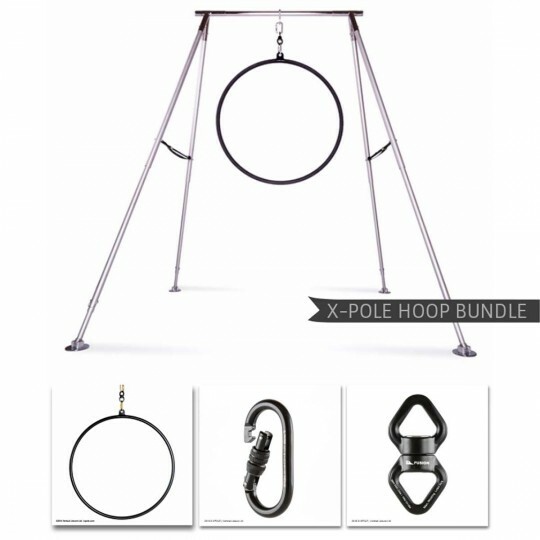 Bring the hoop home with X-Pole’s exclusive range of aerial hoop. The Pro Hoop single point is aerial industry standard diameter of 1 inch (25.4mm) thick tubing. Our Pro hoops have been force load tested and rated on a ratio of 5:1 with a distortion point of 600kg/1200lbs. A carabiner is used to connect the apparatus to a swivel or other hardware, and/or rigging point. The carabiners we use are Fusion Hardware black steel autolock carabiners, which are very standard for the industry, and have a safety autolock (locks automatically). A swivel is used for spinning. May be used with hoops, hammock, or silks. Any apparatus may be set up without a swivel, however for many apparatus, especially hoop, a swivel is preferred. The diamond shaped or delta swivel is best for one carabiner because of the bevel. The round swivel may be used with 1 or 2 (multiple) carabiners attached.